The William Way LGBT Community Center, located at 1315 Spruce Street, has been serving the Philadelphia LGBT community for 35 years. Its history is one of overcoming obstacles, and although its name and location have changed several times, its mission never faltered: "The William Way Community Center seeks to encourage, support, and advocate for the well-being and acceptance of sexual and gender minorities through service, recreational, educational, and cultural programming." In 1969, the Stonewall riots in New York gave rise to new gay political movements and a sense of gay community in Philadelphia. By 1970 a Gay Liberation Front began at Temple University, and the University of Pennsylvania had one soon after. The GLF petitioned for a gay rights bill and sponsored dances and social events. In 1971, the GLF was replaced by the Gay Activist Alliance. Activists began talking about creating a community space for the LGBT community after Philadelphia's first Gay Pride Parade in 1972. The GAA created the Gay Coffee House at 60 N 3rd Street, where local poets, bands, and folk singers made appearances. Soon after, the Gay Community Center of Philadelphia (GCCP) attempted to find a physical home for Philadelphia's very first gay community center. They found a space at 326 Kater Street. The center opened with a party, a dance, and an art exhibit and it housed the Gay Coffee House, the Gay Switchboard, and the GCCP Library. Over the next five years, the center provided classes, workshops, art exhibits, performance venues, movies, programs, meeting spaces, gay and lesbian rap groups, and weekend dances for the community. In 1980, rising rent costs forced the GCCP to leave Kater Street. The GCCP initiated a "We're Moving Up" campaign to raise money to find another location. After much fundraising, they found a place in the Lincoln Apartments at 222 Camac Street. 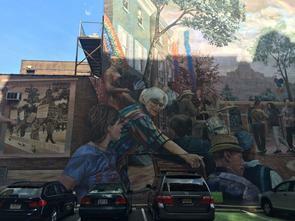 The Philadelphia Gay Rights Bill was passed by City Council at the time the GCCP was at Camac Street. However, more rent increases and budget problems forced the center out of its location. Many felt that fundraising for a new community center would take away from efforts to raise money for the AIDS crisis, which got no support from the government. The center on Camac closed in December 1983. In April 1984, the Board of Directors formed a New Center Project Committee that would plan for a new facility located in Center City. The board maintained GCCP functions and ran the library, which relocated to the Community Education Center at 35th Street and Lancaster Avenue. They were not able to find a location, and in 1986 the Center became "Penguin Place: The Community Center Without Walls." Its name came from a gay rights march in Washington, D.C., where a government official said "The next thing they'll demand is rights for penguins." Penguin Place sponsored AIDS Walks and its own events despite not having a physical home. It temporarily resided at 211 S Quince Street, but due to problems with the lease, discrepancies with ownership of the building, and a mysterious fire, they soon began searching for a new location. Next, the Community Center moved to 201 Camac Street and officially became the Lesbian and Gay Community Center. 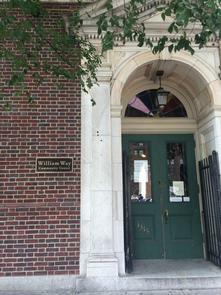 In 1995, the board changed the name to the William Way Center after city employee and activist William Way and in 1996 they purchased its current location, 1315 Spruce Street. In 2005, Mel Heifetz paid off the mortgage so that the William Way Community Center has full ownership of its building. The William Way Center is one of the few community centers in the country that the community itself completely owns, and it can invest all of its resources back in the community.